After 500 years Henry VIII still retains a public fascination unmatched by any monarch before or since. Whilst his popular image is firmly associated with his appetites - sexual and gastronomic - scholars have long recognized that his reign also ushered in profound changes to English society and culture, the legacy of which endure to this day. 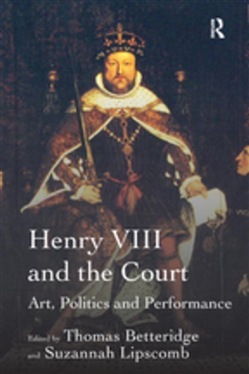 To help take stock of such a multifaceted and contested history, this volume presents a collection of 17 essays that showcase the very latest thinking and research on Henry and his court. Divided into seven parts, the book highlights how the political, religious and cultural aspects of Henry's reign came together to create a one of the most significant and transformative periods of English history. The volume is genuinely interdisciplinary, drawing on literature, art history, architecture and drama to enrich our knowledge. The first part is a powerful and personal account by Professor George W. Bernard of his experience of writing about Henry and his reign. The next parts - Material Culture and Images - reflect a historical concern with non-documentary evidence, exploring how objects, collections, paintings and buildings can provide unrivalled insight into the world of the Tudor court. The parts on Court Culture and Performance explore the literary and theatrical world and the performative aspects of court life, looking at how the Tudor court attempted to present itself to the world, as well as how it was represented by others. The part on Reactions focuses upon the political and religious currents stirred up by Henry's policies, and how they in turn came to influence his actions. Through this wide-ranging, yet thematically coherent approach, a fascinating window is opened into the world of Henry VIII and his court. In particular, building on research undertaken over the last ten years, a number of contributors focus on topics that have been neglected by traditional historical writing, for example gender, graffiti and clothing. With contributions from many of the leading scholars of Tudor England, the collection offers not only a snapshot of the latest historical thinking, but also provides a starting point for future research into the world of this colourful, but often misrepresented monarch. Acquista Henry VIII and the Court in Epub: dopo aver letto l’ebook Henry VIII and the Court di Suzannah Lipscomb ti invitiamo a lasciarci una Recensione qui sotto: sarà utile agli utenti che non abbiano ancora letto questo libro e che vogliano avere delle opinioni altrui. L’opinione su di un libro è molto soggettiva e per questo leggere eventuali recensioni negative non ci dovrà frenare dall’acquisto, anzi dovrà spingerci ad acquistare il libro in fretta per poter dire la nostra ed eventualmente smentire quanto commentato da altri, contribuendo ad arricchire più possibile i commenti e dare sempre più spunti di confronto al pubblico online.